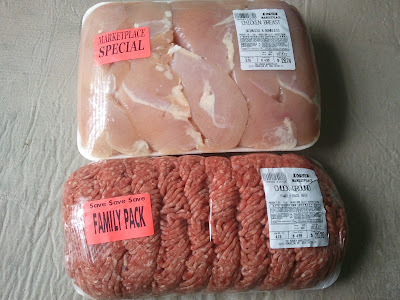 Browse » Home » Other Stores » I spent half my budget on meat! I spent half my budget on meat! I was out of meat - I mean, nothing in the freezer at all! So I headed over to my kosher butcher. If you don't know, kosher meat is very expensive compared to regular meat. So these prices are quite high. But I'm frugal and use coupons on other food items so that I can afford to spend the necessary money on kosher meat. I generally choose inexpensive cuts of meat, though this time I bought boneless chicken breasts instead of whole chickens or pieces. And I'm frugal in the way that I use the meat - I'm sure to get as many meals out of it as I can while still providing the protein that my family needs.